What a fun week we have ahead of us! As tensions continue to rise in the second season of the Korean leagues, a wealth of community tournaments will be taking place. The TING Open will wrap up the Ro16 this week and start their Ro8 Group Stage, while Olimoleague will be holding their first broadcast since partnering with Twitch Korea. Both of these will be hosted on BaseTradeTV, so if you enjoy their broadcasts be sure to tune in to those! 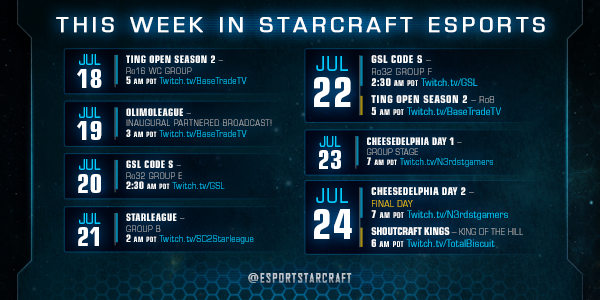 Saturday will kickoff the East Coast grassroots event Cheesedelphia, while Sunday holds that tournament's finals and the inaugural ShoutCraft Kings, hosted by TotalBiscuit. 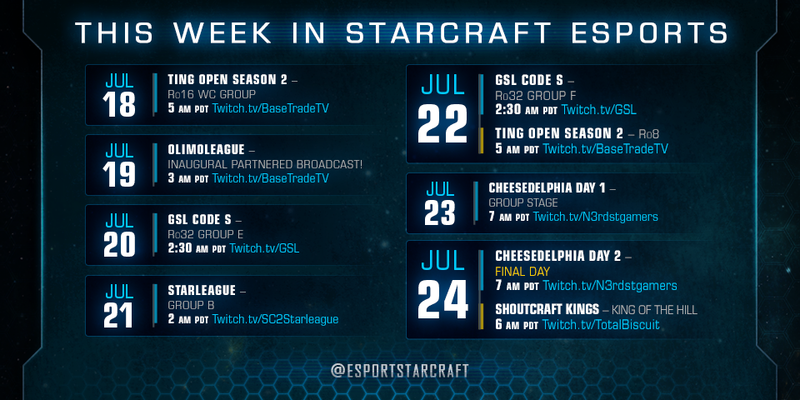 For more high-stakes action be sure to tune into each of these events! We know, we know. . . that's a lot of StarCraft, but that's a good problem to have! See the schedule below and mark down what you find most important. We'll see you next week!